My friends and family have known for years that I am a character and a cartoon, but now I can cut loose some real proof. My “Don’t Fart in an MRI” inspired Lola, the sassy curmudgeon of the daily comic pages, to assume the position and copy me. I don’t want to raise a stink, sound offensive, or toot my own horn, but I’m putting on airs to permeate such a ripe compliment. This cartoon passes the smell test for lighting up my day. I’m truly relieved. My essay on The Huffington Post has generated almost 680,000 likes since it was published in late October. (http://www.huffingtonpost.com/elaine-ambrose/dont-fart-during-an-mri_b_6044578.html) The piece was subsequently published in Germany, Italy, Korea, and Brazil and included in several newsletters and magazines. After 40 years of professional writing, I finally got noticed because we all secretly have the maturity of 10-year-old boys. Over the weekend, I met Todd Clark, the creator and artist for LOLA, a nationally syndicated comic strip featuring a sassy senior citizen. Clark introduced the character in 1999, and she’s still causing chuckles for readers of all ages. 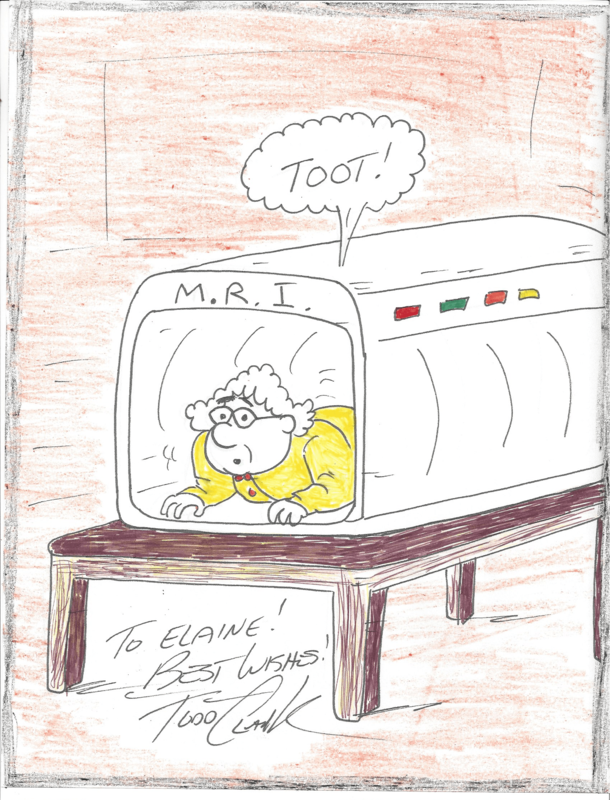 I told Clark about my embarrassing medical experience, and he quickly sketched some artwork showing Lola tooting in an MRI. It’s not exactly Wonder Woman, but the caricature fits my personality…and life experiences. 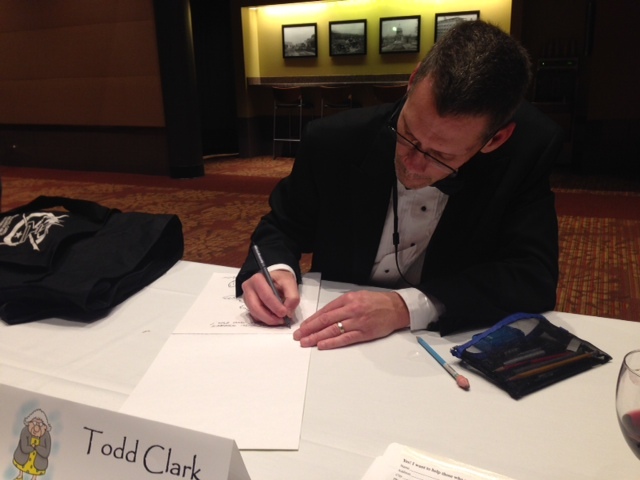 Clark was creating cartoons at the annual Guardian Ball in Boise, Idaho. The event benefits severely wounded, injured, and ill veterans in the Wyakin Warrior Foundation. The Foundation provides one of the most comprehensive education, mentoring, professional development, networking and job placement programs in the country for severely wounded and injured veterans. My stepson, a Marine who was wounded in Iraq, is a member of the Wyakin Warriors. Well, everyone’s gotta be something, Elaine, keep that in mind, right? When you drop a stinker you never know how far and wide it will reach. That your essay has provided chuckles around the globe, and is now helping veterans is proof that passing gas is good for the world, but only if you talk about it. You are famous and funny! Owing to the cartoon, greater numbers will inhale your hot air. The sky’s the limit! What a great honor! I have never known anyone who is immortalized in a cartoon. Evidently everyone in many countries enjoy a fart story. 680,000 Likes. That’s fabulous. And it’s not because we all love farts. It’s that we love your writing about farts.